In last article we have seen about the detail description about the 3rd level of software testing process. Now let’s move to the other level. Level 4, in which we have to define exit criteria. In First level we have Planned about testing phases, In 2nd level we have design the test cases, In 3rd level we have executed & implement the testing phases & Now in level 4, we will define the exit criteria and In level 5 final Test closure procedure & Activity will be done. Sometimes it happens that the application have so many module and it has large number of test cases but we have less resource for testing the same application. At that time we have to define a risk level of the application. This kind of situation is taken case in this phase. Other scenario is application is not that much big but the estimation for application is given less by client so we have to manage each activity of application development in less timings. At this time also we need to define risk criteria of an application. As per the requirement, risk have been taken for the application plus exit criteria is define here. 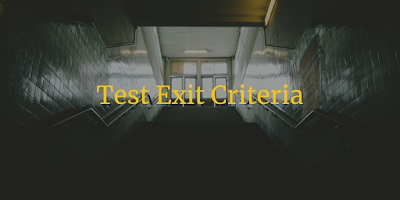 Exit criteria is define like enough testing. We have to decide that by how many test cases should be run for doing enough testing of the application. This will define by exit criteria. This exit criteria can be define differently for different kind of project. Exit criteria will be used when less number of pass test cases have been logged in the Test log. This kind of situation is clearly define that Less number of test cases have been passed so application is not that much stable to deliver to the client. Next situation is lots of bug for that application have been post by testing team. Thus, again application is not stable to deliver the client before resolving the issues. Other situation is, Dead line is near but we cannot deliver the application as it is not stable enough. Here we need to define like by what way we can deliver the application and how many critical issues only will be solved by developer team. By above points we can define several tasks for exit criteria is, To verify the testing logs towards exit criteria which is related with Test plan. For Example, We have define 50 test cases for the exit criteria. If this 50 test cases have been passed successfully then our application will be stable and we can deliver to the client. Make sure that this 50 test cases have high & critical priority & it must cover all the requirements of the client. Here if low and medium priority test case have been failed still application will be delivered to the client if dead line is arrived as in exit criteria we have define on 50 test cases which needs to be pass successfully. 2nd task is, If client will define more requirement then we have to define exit criteria with more number of test cases. We have to writer detail test summary reports to our client about our testing activities and all the member of the project should be aware about this. Thus, in exit criteria we need to send an email for Test summary report. This is all about the defining exit criteria in software testing process. This is the last step of software testing procedures. This activity will be taken place when application or software have been delivered to the client. Another reason for closing the testing is, when all the information regarding project is not shared properly by the client. In this case we can close the project as there are no reason to start developing the same. If Project is cancelled by client itself then also we have to create a documents for test closing and define the reason that why it happened. Testing will be closed when enough target have been achieved and no further enhancement is required by clients. They are happy with the product then we can close the testing. To achieve the test closure activity, we have to do several tasks like to verify about the deadlines and make sure that product have been delivered on time with all the reports and logs? All the information regarding automation scripts and environment should be saved to use further. To maintain the application, all the handover process have been done within the team for supporting software or application. All lessons which have been learnt during the testing phase that must be shared with team. This all about the Test Closure phase in software testing process.